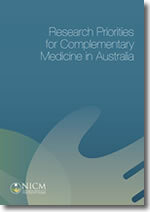 The establishment of Research Priorities for Complementary Medicine in Australia has been one of NICM's key initiatives in its first years of establishment. The project commenced in 2009 and was finalised in late 2012. To help identify priorities for research in Australia, a review was commissioned of the available evidence for the therapeutic use of CM in Australia's National Health Priority areas. This report documents the key findings of the review, and the processes undertaken to arrive at the findings. The report seeks to 'narrow the field' and identify those treatments that offer the greatest potential to meet Australia's healthcare needs. The approach involved harnessing the expertise of some of Australia's leading experts, in a cooperative and collaborative process, to shortlist the best candidates for future research investment. The end result is a considered perspective of where future research investment should be directed. Highlight the need for greater investment in CM research in response to high levels of use by the community and perceived benefits in the management of chronic illnesses. The Report will be of interest to Australian researchers, State and Federal Government Ministers, policy makers and funding agencies; disease-based organisations; consumer groups; health insurers and other stakeholders; and complementary healthcare peak bodies.